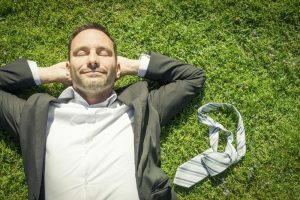 You’re reading 5 Ways to Create Your Own Work and Life Balance, originally posted on Pick the Brain | Motivation and Self Improvement. If you’re enjoying this, please visit our site for more inspirational articles. The pace of life today can sometimes make it feel like you’re walking a tightrope. You’re trying to balance the need to be engaged in your business and get projects done with the need to be present at home, have a fulfilling personal life and avoid burnout. This is really nothing new for small business owners devoted to helping their businesses grow and thrive. There are many ways to find that balance (and I hope you’ll share your own ideas in the comments), but here are the five things I’ve found that really help me remain grounded, balanced and comfortable on the high wire. It’s very common for small business owners to spend their work week ignoring the clock. In fact, I would often get a phone call from my wife at 2 a.m. wondering if she should just bring me a sleeping bag from home. That was my cue that it was time to call it a day. I wasn’t ignoring home, but I was anxiously engaged and very motivated, so the hours just slipped by. Unfortunately, while invigorating, it doesn’t take long for the endless hours on the job to take their toll. Even though I loved what I was doing, the lack of sleep and never being home not only caused a bit of family strife—I also found myself struggling to concentrate and more likely to forget things. I was a little more irritable, too. Things that were really no big deal became really annoying. I recognized that there would always be things that needed attention. I could work 24/7 and still have things that needed to be done, so I decided to set a time each night when I would leave my business for the day. To be fair, saying I was going to do it was easier than doing it, but my mood improved and I was more productive during the hours I was there. That shouldn’t have been a surprise, because most research on the subject suggests those who achieve a good work/life balance are more productive than those who don’t. (One example is a study conducted by the Corporate Executive Board, which represents 80 percent of Fortune 500 companies, and reports that employees who feel they have a good work/life balance are 21 percent more productive than those who don’t.) Although much of the research is based on employees, I found the same to be true as a business owner. Count the times this week that you disengage from a conversation with someone to look at your smartphone because it’s beeped, chirped or buzzed. You might be surprised at how distracted you really are. I found myself, sometimes mid-sentence, stopping to check an incoming text message or email. I’ve also noticed my wife (or one of my friends) abruptly stop talking because I was not paying attention to what they were saying because I was distracted by something on my smartphone. The good news is that when I started ignoring my Pavlovian reaction to my phone buzzing, I became more engaged in conversations, meetings and my interactions with others. What’s more, the phantom phone buzz in my pocket (yes, it’s a common phenomenon) went away. And, like any recovering addict, I am now sometimes frustrated when I’m ignored by someone answering his or her smartphone’s siren song in the middle of a conversation with me. One of the hallmark talents of successful small business owners is their ability to creatively problem-solve. Downtime, or sleep, positively impacts your brain’s ability to function. Sleep deficiency alters the way your brain works and makes it more difficult to make decisions, solve problems, control your emotions and cope with change—all critical abilities for small business owners. What’s more, sleep deficiency has also been linked to depression, suicide and risk-taking behavior. Although there is no cut and dried answer to exactly how much sleep you might need, I’d suggest three or four hours probably isn’t enough. Even though everyone is different, seven to nine hours of sleep is probably the goal you should shoot for. If you don’t get enough sleep, your brain can shut down in what’s called “micro-sleep.” In other words, little bursts of sleep that can happen when you’re normally awake. In fact, some studies have shown that sleep deficiency (drowsy driving, for example) can impact your ability behind the wheel of a car as much, or more, than driving under the influence of alcohol. Active leisure pursuits and activities like taking a vacation help buffer or eliminate job stress. After a successful vacation, you will be able to return to your business reinvigorated and ready to make decisions and tackle challenges. These benefits also extend to family relationships and can contribute to family bonding, communication and solidarity. Vacations promote what’s called a “crescive bond” or shared experience to help promote these ties, according to Xinran Lehto and a group of researchers from Purdue. In other words, they suggest there’s a strong correlation to the light emitted by our electronic devices and the role it could be playing in our ability to easily fall asleep. “Photoreceptors in the retina sense light and dark, signaling our brain about the status of the outside world and aligning our circadian rhythms (centered in a small region of the hypothalamus called the suprachiasmatic nucleaus) to the external day-night cycle. This signaling of light and dark helps us be alert in the morning and fall asleep at the appropriate time at night. We’ve already talked about the importance of getting enough sleep. Opening up your backlit computer screen, your smartphone, or tablet as you climb into bed might be part of what makes it difficult to fall asleep at night. The nature of how we work has changed a lot since I began my career over 35 years ago. What works for you might not be the same as what works for someone else, so finding the balance for you may be different from what I need to find balance in my life. Nevertheless, these five suggestions will help you discover the strategy that will work for you. I’m not sure balance is even the right word for it anymore. I’m of the opinion that we need to integrate our professional lives with our personal lives in such a way that we have adequate time away from work, and are able to get the amount of sleep our mind and body needs to keep our brain functioning properly. How do you balance your work life with your life away from work? Please share your tactics in the comment section. Ty Kiisel is a contributing author focusing on small business financing at OnDeck, a technology company solving small business’s biggest challenge: access to capital. With over 25 years of experience in the trenches of small business, Ty shares personal experiences and valuable tips to help small business owners become more financially responsible. OnDeck can also be found on Facebook and Twitter. You’ve read 5 Ways to Create Your Own Work and Life Balance, originally posted on Pick the Brain | Motivation and Self Improvement. If you’ve enjoyed this, please visit our site for more inspirational articles.